“Kissing Jack was dangerous—like drowning in something that tasted good. He was like the chocolate cake she couldn’t resist, full of artery-clogging butter and heavy cream, heaven in her mouth but hell on her heart.” -from INTO THE FIRE. This is a fabulous cake cake! It’s quick and easy if you aren’t afraid to whip egg whites. If you are afraid to whip egg whites, this cake is worth overcoming your fear. It’s fluffy, yet intense. Rich. Dreamy. Utterly satisfying. My favorite chocolate experience…so I gave it to Lila in INTO THE FIRE. I’d say she appreciates it, wouldn’t you? Pan: 9” Springform, lined with parchment circle. Spray parchment only with pan spray. 1. Melt chocolate and butter in the top of a double boiler over simmering water. 2. Separate 4 eggs. Reserve the whites in a clean, dry bowl. 3. Combine the 4 yolks with 2 more whole eggs and ½ cup sugar. Whisk until combined. 4. Stir the melted chocolate and butter mixture into the egg yolk and sugar mixture just until combined. Set aside. 5. In a squeaky clean bowl with a squeaky clean whip, whip egg whites. When they begin to form peaks, slowly add the remaining ½ cup sugar, just a tablespoon at a time, until the peaks become stiff. The idea is that you want them whipped enough to add body, but not so stiff that they won’t combine smoothly with your other ingredients. Better under than over with this recipe. 6. Fold the whites into the chocolate egg mixture just until the streaks of white disappear. Don’t deflate your whites with too much folding. 🙂 Pour into your prepared pan and smooth gently. 7. Bake for exactly 35 minutes at 350 Farenheit. Give the pan a jiggle. If it seems set, it’s perfect! Otherwise give it 3-5 more minutes and then take it out. Let cool completely. 8. 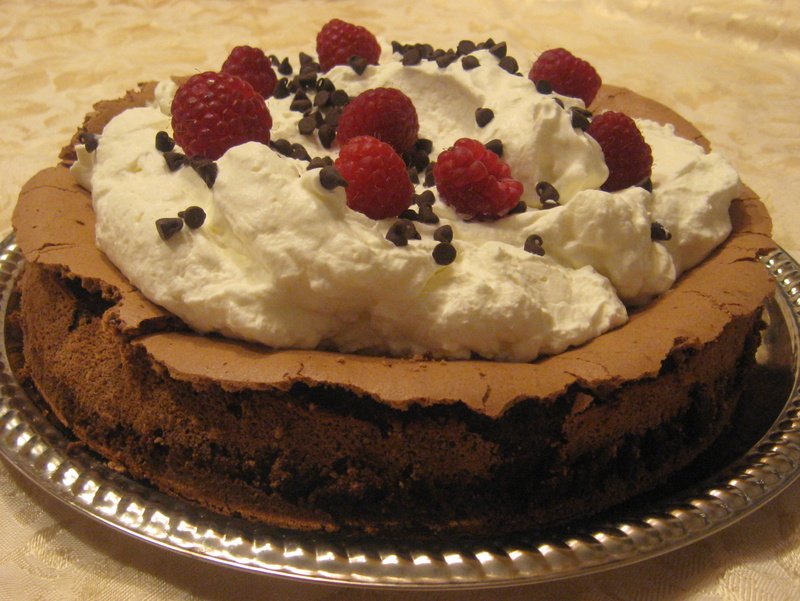 Cover with a swooping blanket of whipped cream, chocolate curls, chips or a dusting of cocoa powder. Serve with berries if you want to impress your date or your family. Hoard the leftovers and have them for breakfast…in bed!